For many people, the purpose of photography is to document periods in their own lives and those of their family. This might be everyday snaps of the kids, or nights out with friends, but more often than not amateur photographers also wish to document special occasions through the medium of photography. 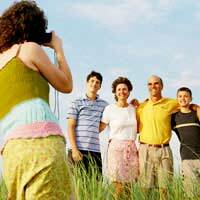 A favourite topic for many amateurs and professionals alike is the family holiday. Getting great holiday photos can, however, be a difficult task. This is, of course, generally a mixture of portraiture and landscape photography; holiday snaps tend to concentrate on the place in which you were staying and the people you were there with. As a result, you are required to concentrate on two different disciplines. The great skill of holiday photography is capturing a sense of the environment and the mood of the subjects. In order to achieve this, there are a few tips that you can try and employ if you find yourself struggling to get the shots that you want. To begin with, you should remember that you may be required to shoot in a very different environment to that to which you are accustomed. If, for example, you are taking photos on a ski slope, you may well have problems with lens flare; adaptability is the key, and so you should ensure that you have one eye on your exposure settings at all times. On a more artistic level, however, there are several guidelines that should stand you in good stead. In many ways, good holiday photography is like good candid photography, and you should therefore try to capture your companions enjoying themselves. This could, of course, be conveyed through facial expressions or movement, but you may also consider composing pictures which show the subjects taking part in a relevant activity. The activity itself need not be hugely overstated (a photograph of a contented sunbather can say more about the subject than a photograph of a snowboarder, for example), but the subject’s interaction with their surroundings should be emphasised. The content of your shots is vital, of course, but the composition is also hugely important. Candid photography (which essentially describes holiday photos) often works best when the viewer feels party to the action in the photograph. Don’t be scared to get close to your subjects, particularly if you have a short lens, in order to try and capture the action from a participant’s perspective. If the shots are simply for your friends and family, then they are likely to appreciate the involvement of the photographer in the group. Finally, you should bear in mind that many professional photographers shoot rolls and rolls of film before capturing the one great shot that they have been waiting for. Don’t be put off shooting lots of frames; in many situations, the ‘scattergun’ technique, when combined with some thought about the composition of the photographs, is the only way to get a great shot. Keep taking lots of photos and eventually the inspiration will come to you in the form of the image that perfectly sums up your holiday.